Christopher Asher Wray (born December 17, 1966) is an American lawyer. He is the 8th and current Director of the Federal Bureau of Investigation since August 2, 2017. From 2003 to 2005, he served as Assistant Attorney General in charge of the Criminal Division under the George W. Bush administration. He is currently a litigation partner with the law firm King & Spalding. Wray was born in New York City. He was raised in Andover, Massachusetts. He studied at Yale University. 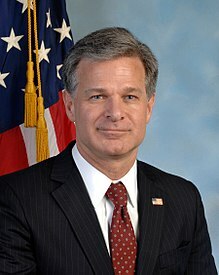 In 2003, President George W. Bush nominated Wray as Assistant Attorney General in charge of the Criminal Division of the Justice Department. Wray was unanimously confirmed by the Senate. Wray was Assistant Attorney General from 2003 to 2005, working under Deputy Attorney General James Comey. While heading the Criminal Division, Wray oversaw prominent fraud investigations, including Enron. On June 7, 2017, President Donald Trump announced his intention to nominate Wray to be Director of the Federal Bureau of Investigation. On July 20, 2017, the Senate Judiciary Committee voted unanimously to confirm Wray to be the next director of the FBI. Wray was officially confirmed by the Senate with bipartisan support on August 1, 2017; the vote was 92–5. He was sworn in by Attorney General Jeff Sessions in a private ceremony on August 2. Wray married Helen Garrison Howell in 1989. They have two children. He is registered as a Republican. ↑ "Confirmation Hearings on Federal Appointments" (PDF). Committee on the Judiciary. p. 849. Retrieved June 7, 2017. ↑ "Christopher A Wray". www.kslaw.com. King & Spalding. Retrieved June 7, 2017. ↑ Gerstein, Josh (June 7, 2017). "5 things to know about Trump's FBI pick Christopher Wray". Politico. ↑ "Christopher A. Wray". United States Department of Justice. Retrieved June 7, 2017. ↑ "PN705 — Christopher A. Wray — Department of Justice". U.S. Congress. Retrieved June 7, 2017. ↑ Markham, Jerry W. (2015). A Financial History of Modern U.S. Corporate Scandals: From Enron to Reform: From Enron to Reform. Routledge. ISBN 9781317478157. ↑ realDonaldTrump (June 7, 2017). "I will be nominating Christopher A. Wray, a man of impeccable credentials, to be the new Director of the FBI. Details to follow" (Tweet). ↑ "Senate panel votes to confirm Christopher Wray as new FBI director". USA Today. July 20, 2017. Retrieved July 21, 2017. ↑ "Senate confirms Wray as next FBI director". Washington Post. Retrieved 2017-08-01. ↑ "Senate roll call vote PN 696". United States Senate. August 1, 2017. Retrieved 2017-08-01. ↑ "Statement by Attorney General Sessions on the Swearing in of FBI Director Chris Wray". www.justice.gov. Retrieved August 2, 2017. ↑ Shaw, Adam (16 February 2018). "Florida Gov. Rick Scott calls for FBI Director Christopher Wray to resign in wake of Parkland school shooting". Fox News. ↑ "Who is Christopher Wray? The Christie attorney named as Trump's FBI pick". This page was last changed on 15 February 2019, at 15:59.